Gabriel Hart: Belated release party for "Nothing To See Here" at High Desert author throwdown / blowout! Belated release party for "Nothing To See Here" at High Desert author throwdown / blowout! 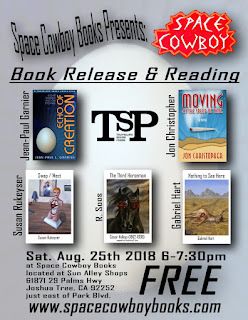 It's been such an accelerated year so far that we didn't have a chance to do an official High-Desert release party for my novelette Nothing To See Here, which was released by Space Cowboy in December of 2017. Luckily, 2018 has seen the desert brimming with such exceptional literary releases - by Space Cowboy, Traveling Shoe Press, and Cholla Needles - so we decided to do a kind of aggregate release party for five authors/five books that came out recently - coming up here at Space Cowboy books Saturday, August 25th at 6pm. Echo of Creation by Jean-Paul Garnier (Traveling Shoes Press) is the debut sci-fi short story collection by the man behind Space Cowboy books. Garnier has a singular, wise-beyond-his years imagination that was born for Sci-Fi. Combining tech-savvy insight, jaw-dropping psychedelia, and the often over-looked sentimental triggers of the common man and woman, the collected eight tales in Echoes Of Creation is the perfect aggregate for one maddeningly prolific writer. The stories follow sci-fi themes yet reserve their own dare for the reader to classify, such as the Black-Mirror-esque title-story that opens the book with a coming-of-age soap opera that ends in a chilling variation on our youth’s mortal coil. Much like the other iconic authors of the genre, Garnier relies just as much on the imperfections of our past as he does the break-neck acceleration of our future, in a brave effort to get down to the bottom of what our disorienting present is trying to tell us. Moving At The Speed of Time by Jon Christoher (Traveling Shoes Press) - Jon is another insanely prolific writer (by the end of 2018, he will have released three novels in the past year, this being his 2nd) as well as the man behind Traveling Shoes Press. In MATSOT, Christopher successfully avoids all the dorky trappings often associated with marijuana counter-culture. Instead, he weaves a tale that shows the true profound effect that weed has on our lives, often intertwining every day groups of people that wouldn't normally groove together, showing what a divine gift from the God's above - or the underground serpent saints - it can truly be. Swap / Meet by Susan Rukeyser (Space Cowboy Books) - fierce newcomer to the desert yet accomplished novelist in her own right (author of the sublime Not On Fire, Only Dying), Susan Rukeyser just dropped one of the more inventive, comedic and in turn, heartbreaking chapbooks I have ever read. The book takes nine fictional (?) classified ads where the seller is not only selling something, but severely oversharing scandalous notes of their lives. There is a big reveal hidden in here, but the most relatable one is the reminder of what a lonely world it can be, where people do not only feel alone, but misunderstood and may stop at nothing to tell their own side of things, regardless of an interactive audience. It reminded me of my first job as a teenager, answering phones at Pizza Hut, where I would often get trapped on the line with people who just.. needed... to talk. Highly recommended. The Third Horseman by R. Soos (Space Cowboy / Cholla Needles) - The man behind Cholla Needles Art and Literary Library throws down a masterful translation of the great Cesar Vallejo. Heavy on the angry God element of Catholicism, other poems in this collection take some reprieve in the ports of Lima where he spent his upbringing. A god-send for someone like me who loves Vallejo but failed Spanish in high-school and can't quite get past the subsequent inferiority complex. Nothing To See Here by Gabriel Hart (Space Cowboy) - the darkest part of my novel in progress Lies of Heaven seems to stand well on its own - on its second pressing, going fast... Done talking about myself. Click above for more info.